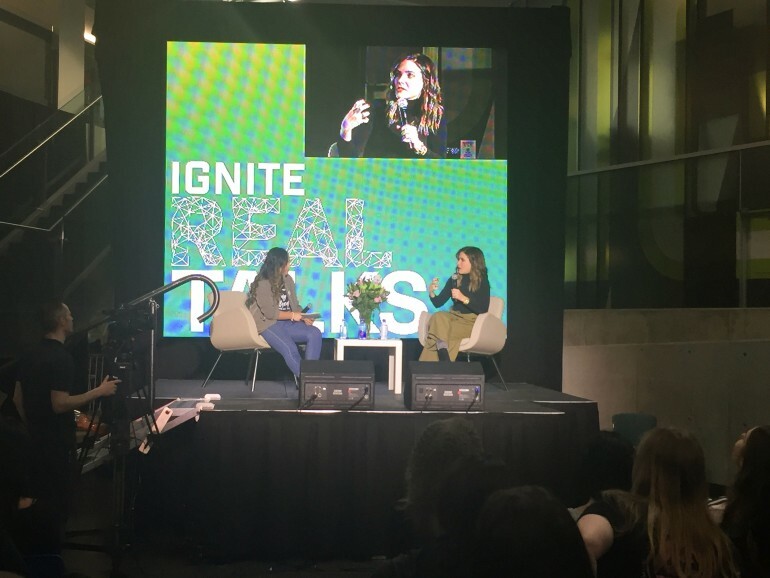 Sophia Bush discussed the importance of education and females breaking down barriers with IGNITE president Maja Jocson. Listening to actress Sophia Bush and model Iskra Lawrence talk about education and empowerment struck a cord with public relations student Renee Johnson. The Lakeshore campus student said it was important hearing the two stress education during an IGNITE Real Talk session at the Student Centre on Thursday as part of International Women’s Day celebrations. “Because there are so many times that I just want to quit school but hearing Bush say how school played a key component in her life just makes me want to push a little more to becoming my own boss,” Johnson said. Bush said because life is a work in progress, women shouldn’t “wait until you’re just a masterpiece. “Life is a work in progress, you’re capable and beautiful and nailing it already,” she said. Lawrence and Bush came to speak and answer questions from the audience of about 200 people about their journeys to success and being an influence of change. The two use marketing and advertising to promote positive images of people, women in particular. Lawrence, who is an entrepreneur and social activist, is also the face of the body-positive Aerie Real Campaign, which changed the American women’s clothing retailer’s branding by not photo shopping its ads. She is also the brand ambassador for the National Eating Disorder Association, which is working to support individuals and families affected by eating disorders. The BBC acknowledged her as one of the top 100 Women Of The Year in 2016. Bush devotes her time to better the education of young women while serving as a global ambassador for Glamour’s the Girl Project, which focuses on breaking down barriers girls face with attending secondary schools in developing countries. Lawrence said she is an advocate for self-love and self-care, with those two things being the fundamental routes for women’s empowerment. Lawrence urges women to build themselves up and then dedicate time towards helping boost other women. “It’s no longer okay for us to not look out for each other as women anymore,” Lawrence said. Bush said women cannot let fear stop them from succeeding. “You can overcome anything, just drop that self-doubt, that’s a start in eliminating fear,” Bush said. “I love sitting in meetings with a big group of men, because they have this archaic thought that because I’m an actor I’m just pretty and dumb,” she said. “Women are powerful beings who are pursuing a seat at the table they usually aren’t assigned to, said Lakeshore campus student Chantal Legere. Dava Grocott, an addictions and mental health services student at Lakeshore, said just being in the same room as Bush was empowering for her. “She touched on a lot of issues that are currently going on in the world, from the #MeToo campaign to oppression against women in Hollywood,” Grocott said. OPINION: Will the Toronto Blue Jays show up this season?